Funko brings the cult-favorite character to their POP! 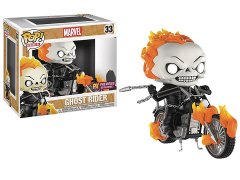 Rides vinyl figure line with this Previews Exclusive piece that depicts Johnny Blaze as Ghost Rider astride his flaming motorcycle! Ghost Rider, engulfed in flame, sports Funko's fan-favorite stylized design, and the figure and bike are in scale with the 3 3/4" scale POP! vinyl figures.